A report by Patrick Oppmann for CNN. That the communist-run government allowed a new church to be built, with two more on the way, represents another milestone in the state’s evolving relationship with organized religion. Immediately after Fidel Castro took power in 1959, his revolutionary government cracked down on religion. Castro viewed the Catholic Church as a particularly dangerous threat to the atheist state he envisioned for Cuba. The revolution soon closed down all parochial schools, sent priests to reeducation camps and drove organized religion underground. But after the collapse of the Soviet Union in 1991, Fidel Castro tried to break the isolation enveloping Cuba by inviting Pope John Paul II to the island. Christmas was restored as a holiday in Cuba and slowly people of faith said they no longer feared worshiping openly. 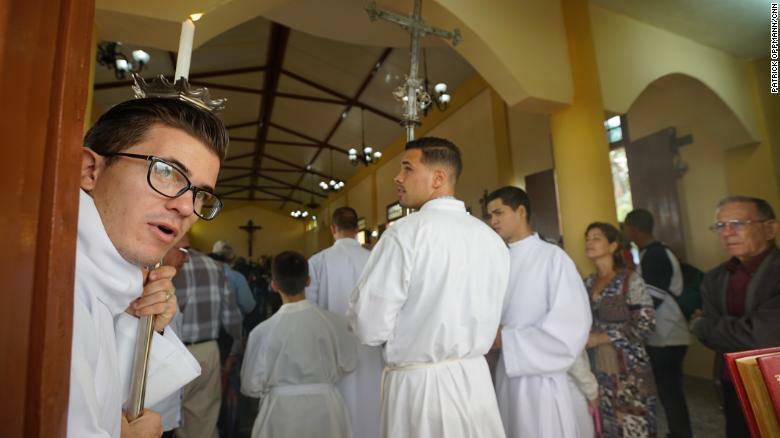 Mass begins at a new Catholic church in Western, Cuba, the first to be built in 60 years. In 2014, then Cuban President Raul Castro publicly thanked Pope Francis for aiding the secret negotiations that led to the restoration of diplomatic ties with the United States. Shortly thereafter, work began on building the church in Sandino. Nearly $100,000 for the new structure was raised by the St. Lawrence Catholic Church in Tampa which after Miami has one of the largest enclaves of Cubans in Florida. “In the United States, with $90,000 you can do nothing but here yes,” said Rev. Ramón Hernandez, who left Cuba for Tampa in the 1980’s and returned to Cuba to attend the opening of the new church. “All the people want to help, including people who are not exactly practicing but they want to help,” he said of the effort to raise funds in Tampa for the new church. Finding building materials in Cuba itself often seems to require divine intervention, and the construction of the church dragged on for four years. “From the day they put the first stone we have been watching it grow little by little. Patience has given us this church,” said Sandino resident Aleida Padrón Zabala, who attended the church’s inaugural mass with her niece and granddaughter. 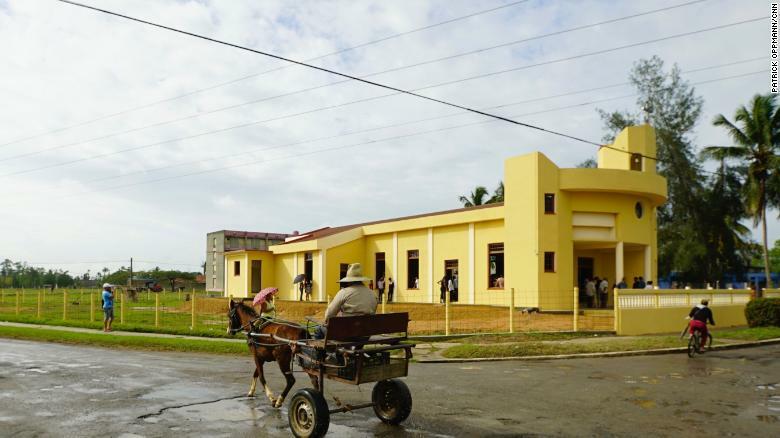 A horse and cart pass by the new church in Sandino, Cuba. The town in the early 1960’s was notorious as a place where Cubans accused of helping anti-Castro rebels were sent to live in internal exile. The bright yellow church — which seats 200 people — stands out among the drab Soviet-style apartment buildings that fill the remote Western Cuban town. Before the church was built, Sandino was best known for being something akin to a Cuban Siberia, where people accused of helping anti-Castro rebels in the early 1960’s were sent to live in internal exile. When CNN visited the town in 2015, Catholics were forced to hold mass in a converted garage that seated only a few dozen people and didn’t have so much as a fan. On Saturday, just before the mass started, Cuban government workers showed up to install an internet connection in the church. “Sometimes you have to overcome many obstacles but then you get to a point where things can be accomplished,” said Monsignor Jorge Enrique Serpa, the bishop for the province where the church is located. “There is a new temple but the church is the people,” he said. ← National Honour For King Tubby?